Alice Cooper is best known internationally as the original shock rocker, and his future place in the Rock and Roll Hall of Fame is almost a certainty. It was much more than just music that has made Alice Cooper a star. It all began at Cortez High School in Phoenix, Arizona. Vincent Damon Furnier and four classmates from the track team formed a group called the Earwigs, and, several names later, renamed themselves the Alice Cooper Group. They were the world's first shock rockers, with many later groups inspired to adopt the concept. 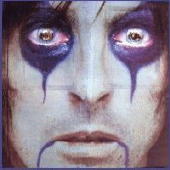 In 1972 Vincent legally changed his own name to Alice Cooper. Although there are different accounts of how this name was selected, I would like to believe the one that attributes his choice to the fact that the name conjures up images of a sweet looking girl hiding a hatchet behind her back. A new era in rock 'n' roll was born. In an interview with The Tribune, Cooper said "We brought theatrics to rock 'n' roll. We did it before Bowie, we did it before Kiss and before anybody. There was no show biz in rock 'n' roll before Alice Cooper. It was taboo and really looked down upon to call yourself showbiz. So when we came along, we went as far out on a limb as we possibly could. We did everything we could to annoy every parent in America, then backed it up with anthems that got played. We had 25 gold albums and sold 50 million records; it wasn't a fluke." Cooper realized that times were changing; people weren't as shocked as before. With the influence and pervasiveness of the media, the violence of our real-life society killed shock. So Cooper adapted. He focused his shows on entertainment with his gruesome make-up, a boa constrictor around his neck and an unhealthy dose of fake blood. Although his humor was very dark, he claims his performances always were based on humor. And at the finale of every performance the star of the show got just what he deserved: decapitation or some other sadistic end. Although he has respect for artists like Marilyn Manson, he believes that Manson might take things a bit too seriously, and the Manson audience feels a bit shameful when all is said and done. But no matter what happens on Alice Cooper's stage, or what evil story the lyrics tell, Cooper believes his job is to entertain his audience and to leave the people feeling good--to make them feel like they were "at the greatest party they were ever at in their lives." As noted by Antony John at his website dedicated to the rocker, "Alice Cooper does not just give concerts; he creates shock-rock events that mesmerize, enchant, and torture audiences around the world." Alice Cooper is still recording. Cooper, now in his fifties, still commands sold out concert crowds. He's had more than 25 albums since 1969. Dragontown was released in 2001.